The decision followed a weekend of negotiations between labor leaders and government officials in order to avert a shutdown of the country’s vital oil industry. The spark which set off what has been dubbed “Occupy Nigeria,” largely because of the significant participation of Nigerian youth, was President Goodluck Jonathan’s decision on New Year’s Day to end fuel subsidies. The government claimed the program is too costly to continue – at an estimated $8 billion per year – and promised to invest the savings in the development of the nation’s energy and transport infrastructure. Nigerians responded with anger as the lifting of the fuel subsidy led to dramatic increases in the cost of food, transportation, and other necessities. They also pointed with skepticism to the billions and billions of dollars lost to the nation’s rampant, notorious corruption, a cancer which affects all levels of the economy and government. Banners in the Lagos demonstrations featured the slogan “Stop corruption, not the subsidy” and protesters re-named the president “Bad luck” Jonathan. Although he was supported by labor unions in his April re-election, Jonathan’s New Year’s surprise engendered strong opposition from a wide spectrum of Nigerian society. 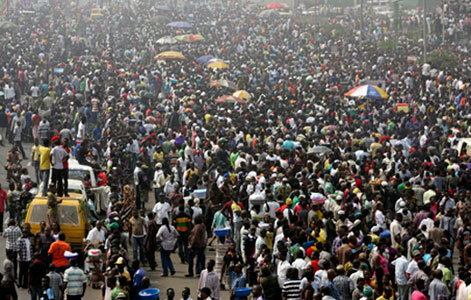 Tens of thousands of Nigerians protested in the streets of the commercial center of Lagos, the governmental capital of Abuja, and the largest city in northern Nigeria, Kano. Banks and businesses were shut, schools vacated, international flights canceled, and the country’s main port closed. While the demonstrations mostly were described as peaceful and orderly, Nigerian media reported 13 protesters killed and scores injured by the police. Curfews were enacted by local governments in cities across Nigeria. The nationwide strike entered a new stage when the nation’s oil workers threatened to disrupt the heart of the Nigerian economy. Last Thursday, the Petroleum and Natural Gas Senior Staff Association of Nigeria (Pengassan), the biggest oil labor union, ordered its members to stop working on Sunday, an action that would have drastically affected the country’s production of 2 million barrels a day. Since many of the operations are automated, the strike would not necessarily have entirely shut down oil production, but certainly would have sent shockwaves throughout the global capitalist economy. The members of the second largest oil labor union, the Nigeria Union of Petroleum and Natural Gas Workers, already had stopped working in solidarity with the nationwide strike. Pengassan officials suspended the strike in favor of negotiations over the weekend. On Monday, President Jonathan announced that fuel prices would be cut by a third and promised to tackle corruption in the oil industry. Although he emphasized the price cut was temporary, unions called off the nationwide strike so that Nigerians could return to work and school. Pengassan President Babtunde Ogun labeled the government’s removal of the fuel subsidy “illegal, hasty, without consultation, and lacking in transparency.” Ordinary Nigerians consider the two-decade-old subsidy the only perk they enjoy from Nigeria’s oil wealth. Neo-liberal economists argue the subsidy discourages investment in local refineries and fosters corruption. The removal of the fuel subsidy struck ordinary Nigerians very hard as the price of gas doubled. While there is a popular perception of fabulously wealthy Nigerians living in mansions and driving the latest luxury cars, fostered in “Nollywood” films and the so-called prosperity Christian churches, at least two-thirds of Nigerians live on less than $1.25 a day. The continent’s most populous nation and sub-Saharan Africa’s second largest economy is a country of extremes, where the super-rich live next to the destitute poor. And despite being Africa’s number one oil producer, accounting for 80 percent of the nation’s revenues, Nigeria imports 70 percent of its fuel since it does not have sufficient refining capacity. Nigeria is the fifth largest oil exporter to the United States, which maintains a significant military presence in the resource-rich West African sub-region, through its infamous AFRICOM program. Most of the oil is derived from offshore oil platforms owned by foreign firms like Exxon Mobil and Royal Dutch Shell, the latter famously accused of environmental degradation and complicity in human rights abuses in the Niger Delta. In short, oil production in Nigeria is a case study in neo-liberal economics and the threatened shutdown by oil workers would have had global ramifications. Yet, the government’s reversal on ending fuel subsidies displays the power workers have to potentially disrupt the capitalist economy.